PM says opposition needs a scandal to bring him down since they can't win elections, praises relationship with Trump Administration. Prime Minister Binyamin Netanyahu delivered a fiery speech at the opening ceremony for the Knesset's winter session Monday, attacking the Opposition, radical left and hostile media. 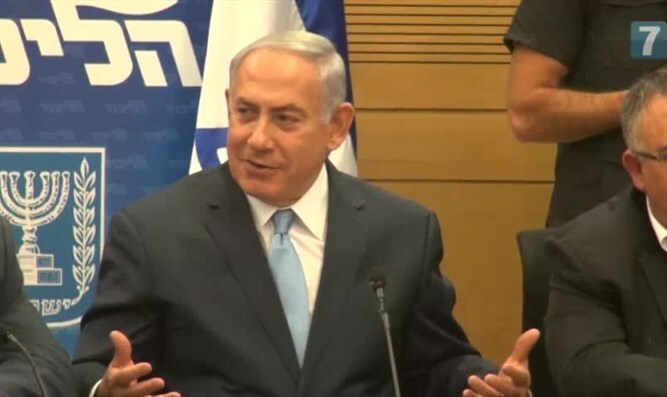 The Prime Minister spoke of the wonderful situation the State of Israel is in at the current time and criticized the "soreheads" in the Opposition and on the far-left who cannot stop whining about how everything is terrible.. He described the new friendly relations with China, India, Russia, African and Asian nations, burgeoning economy, unprecedented tourism - over 3 million came in 2017- hi-tech innovations and the lowest unemployment statistics on record, new roads and construction everywhere, laughing about how 3 million Israelis took overseas trips over the summer and holidays but the leftists among them complain about the cost of living. "The 'industry of depression' is still there and it has respected representatives in this house and in the media," Netanyahu said, referring to certain Oposition MKs. "Today the soreheads say: 'The public is soured,' or 'Netanyahu walks around with a soured expression.' They cannot decide whether I am sour, smug, or both. [They say] that we are missing historic opportunities here. I remind you that these are the same people who criticized my speech on Iran to Congress, and they did so with assumed authority and grave demeanors," he added, reminding them that President Donald Trump agrees with him on Iran. To former Oppositiion leader Yitzchak Herzog, he said: "Herzog, you said: 'This speech is a serious blow to US-Israel relations.' Lapid, you said: 'Your perception of America is outdated and irrelevant, you do not know America.' That is what you said. That I don't know America!" "You are always searching for what's missing, constantly attacking, and you complain all the time. And then there are those who constantly badmouth everything," added the prime minister. "In your case, you put your trust (hopes to unseat the PM, ed.) in the story of the submarine affair, but you already understand that this story is also going down the drain." "In your hearts, you soreheads know that in democratic elections we will win, because we represent very deep, very valuable things for many in this nation. The ministers, the heads of the committees and the MKs are all doing a great job together," he said. In his speech, Netanyahu praised US President Donald Trump for decertifying the Iran nuclear deal and for pulling out of UNESCO, calling the organization the "theater of the absurd." He reminded listeners that anti-Semitism is an old phenomenon and there is a long way to go, but there is progress. He said that the US and Israel see eye to eye on the Hamas-Fatah reconciliation agreement. "We want a true peace, not a false reconciliation with those who want to destroy us,” Netanyahu said. He explained that Israel would not negotiate with a government that includes Hamas as long as the terrorist group does not disarm and accept Israel's right to exist. “This is not only our stance; this is the position of the US."